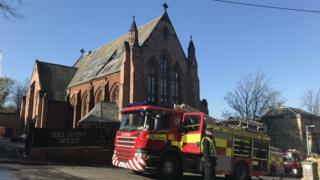 Firefighters remain at the scene of a blaze at a church building in Glasgow. The Scottish Fire and Rescue Service was called to Great George Street, in the city's west end, just after 03:00 on Sunday. It was understood the three-story building was being converted into flats. An SFRS spokeswoman said six fire engines responded to the 999 call but there were no reports of any casualties. Police Scotland said a joint investigation involving the fire service and police is being carried out to establish the cause of the blaze.